The past few days have been extremely busy up on the hill, and my lack of activity online has been partly to do with many, many hours outdoors, stravaiging through the moss. Perhaps even more fundamentally, there has been no internet access in the house since a stunning thunderstorm struck on Tuesday night and lit the entire parish up with purple light. A long telephone call to Mumbai revealed that my internet will be restored this coming week, so I am getting by with brief visits to the Heather Trust office. 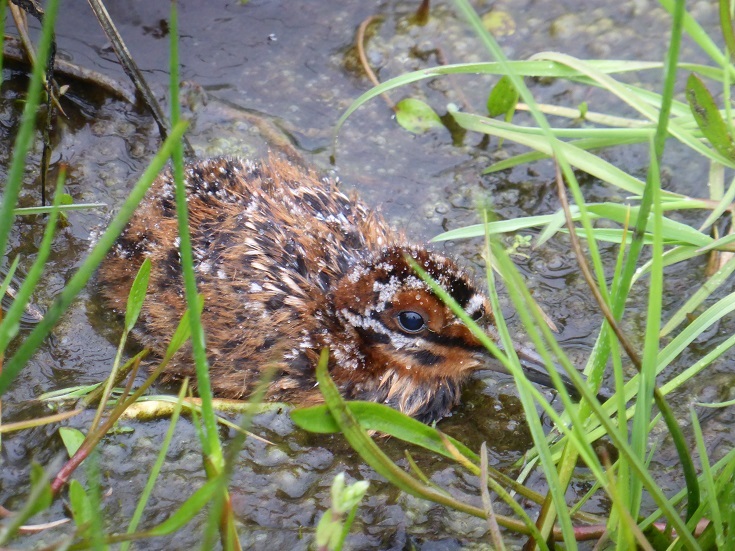 A huge amount has happened which is worth recording on this blog, but suffice it for now to include this picture of a snipe chick which I discovered yesterday while lugging a larsen trap over the hill on my back. The round larsens are the best traps you can buy, but they are not the most convenient to carry over long distances. As I laboured up the last 300 yards to the car, I almost stepped on a brood of three chocolate and brick red fuzzies in a wet gutter just as a shower came sweeping in from the Northeast. One of the chicks flopped down into the water (as above), but the other two made off over the moss with all the zest and fervour of Olympians. I quickly took some photographs, rounded them all up again and beat a hasty retreat back over the hill. Seeing snipe chicks at such a young age was a first for me, and something I’ve always wanted to find on the hill. As the rain set in again, I hoped that the hen bird would quickly settle back down and dry them out. She flew round and round in circles chakking noisily until I was out of sight, and I have fingers crossed that this accidental discovery caused no harm. It is always worth having a few tricks up your sleeve when it comes to catching crows, so that when you have a totally dud year with the larsen there is at least some kind of backup plan. Far be it from me to write blog articles about crow control, but it is worth relaying one little trick which I was taught several years ago and still works as well as it ever did. Received wisdom has it that live crows are terrified of the sight of dead crows. Already we’re into a grey area, because when we say “crow”, we often just mean all corvids, from carrions to jackdaws. When we build a “scare-crow”, it’s probably more likely that we’re trying to scare rooks, and the phraseology gets confusing in no time at all. In fact, rooks are the only “crows” which appear to be frightened by the appearance of their dead brethren, and although this soon wears off, it is clear that there is some registry of understanding there. If you throw a dead pigeon down on the ground, the chances are that it will be totally ignored by other passing pigeons, unless there are white feathers lying around, in which case the pigeons clear off altogether. When decoying pigeons, I’ve had half a dozen dead pigeons in amongst the pattern and it never seemed to make too much difference – that is until you get a runner and the white feathers start to fly. Perhaps this is an indication that pigeons are not quite so acute as rooks when it comes to differentiating between life and death. 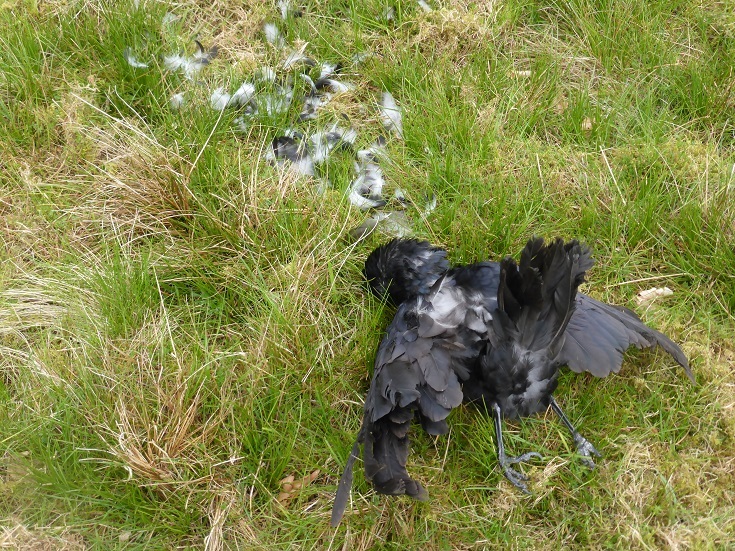 When you watch how a carrion crow reacts to the sight of one of its own lying dead on the grass, you get an idea of where this blog is going. Nothing makes a carrion crow more angry than the inexplicable sight of a dead comrade. If he can see the human being responsible for the death, then the sky will fill with upset, but at a wise distance. The fury is almost palpable, but the bird will be little more than an unassailable speck in the sky. However, if he can’t see what the problem is, the anger is mixed with a good portion of curiosity. The crow knows that something bad has happened, but he doesn’t know what, and the not knowing is almost as irritating to him as the threat that the discovery represents. They scream and yell, descending until they are hanging over the dead body or land in a nearby tree, summoning any other crows which happen to be in earshot. The challenge is then for the human being to be sufficiently motionless that the crows can build up a head of self-righteous steam until the moment comes when as many as possible are in range and the shotgun can step into action. I was having some real trouble with a pair of crows who ransacked at least one grouse nest and were showing every sign of being invulnerable to a larsen trap. I watched them at first light as they peered in through the open doors of the trap and bowed to the callbird, but they stubbornly refused to go inside. This went on for three days until I decided to take more practical action. Taking a dead crow from one of the other larsen traps, I plucked some feathers off its back so that they would swirl around in the wind and catch the eye, then retreated to the fastness of a young beech tree. Full balaclava and hooded ex-military camouflage jacket were the order of the day. Within forty five minutes, the crows in question spotted my little piece of theatre. I could hear them screaming from almost half a mile away, and they came straight in at a fever pitch of bile. So transfixed were they on the dead crow that they never even looked my way. It was a simple case of waiting for them both to be visible at once through the flossy green beech leaves, then it was a simple left and right. It feels counter intuitive to attract an animal with the sight of one of its dead comrades, but the grouse and the curlews have this old trick to thank for sending those two robbers upstairs. It was a stunning afternoon to be up on the hill taking the first cut of peat for the year amidst rumbles of thunder and a riot of skylarks. Green hairstreak butterflies lingered in the milkwort, while a blackcock blazed casually past in the stillness. 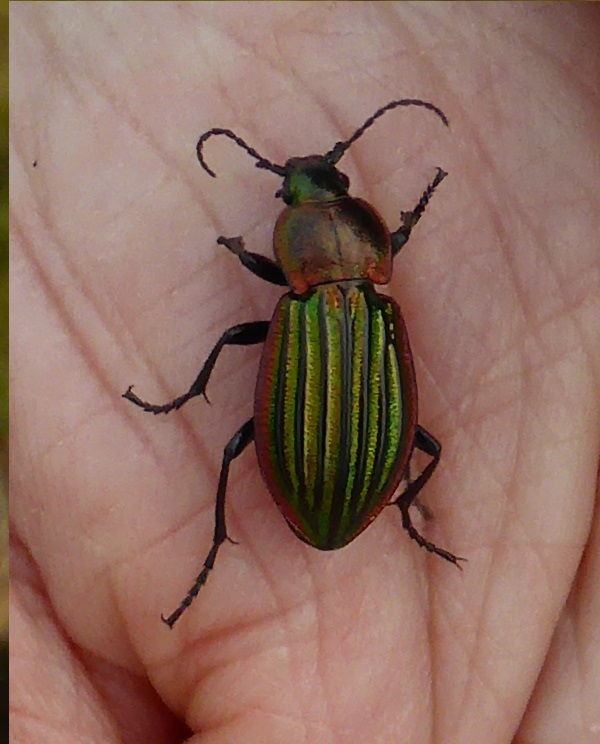 The moss itself was breathing the warm, soft smell of the hills, and the only thing taking the afternoon seriously was a stunning carabus nitens beetle (I looked that up), which was a frantic, furious blur of iridescent green and red through the heather. I must say once again how excellent my peat spade is, which was bought on ebay and had its origins in the Isle of Man. 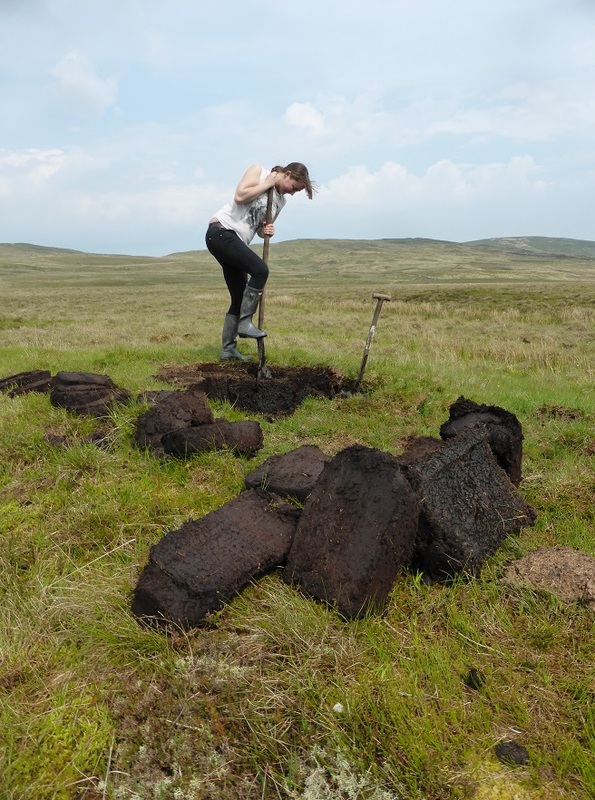 Over an hour or two, we cut out a stack of peats and then turfed the rest so that it will dry before the next cut. Fingers crossed for a good few weeks of sunshine and warm wind. As part of my attempts to find out more about the nesting curlews I discovered yesterday, I was out on the hill this morning just after 3am. A great deal more to come on these curlews, but couldn’t resist posting this very distant “record shot” photograph of one of the new blackcock which are making their presence felt on the Chayne. This is the first time I have managed to get a picture of a Chayne black grouse for several months, and if nothing else it allows me to confirm that he is a 2013 bird. More on him to come too. 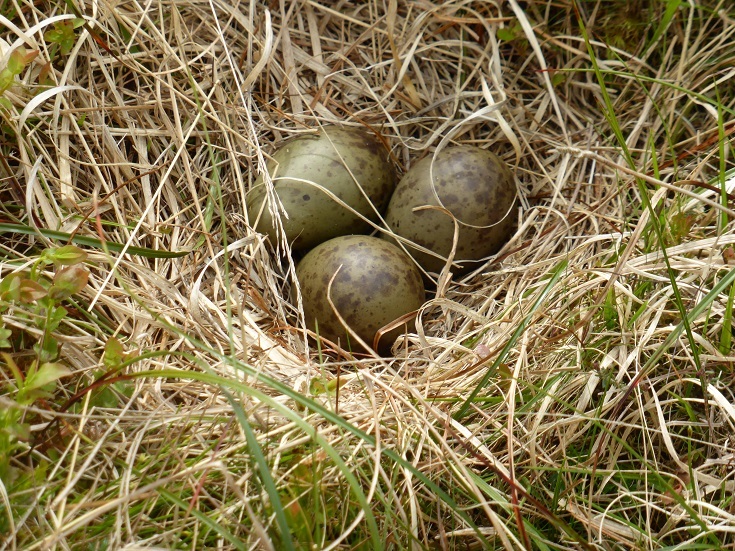 Purely by accident, I happened upon a curlew’s nest this afternoon while changing crows around between my larsens. The hen bird got off silently almost at my feet, and there was the nest; naked and vulnerable on the open hill. Curlews are so dear that to see their eggs lying out in the open was like finding the crown jewels lying unattended on a Sauchiehall Street bench on a Friday night. I took a few photographs, marked the spot and determined to keep a very close eye on this nest’s progress, but I couldn’t help wincing and wringing my hands at how precarious it is. It is within sight of the trees where I found the empty grouse egg, and I suspect the vandal crows will not be long in finding such a collection of gems. I must see to it that they do not. It is quite a good nest site, but the disadvantage of lining your nest with molinia ribbons is that the eggs now have a halo of white all around them. If they were resting directly on the moss and the blaeberry, they’d be far harder to see, but who am I to advise a curlew? The real give-away is the shininess of the eggs, which I could see glinting in the sun when I was still thirty yards away. My “Shire Natural History” guide to curlews informs me that a clutch of 3 eggs usually means that the first (and more normal) clutch of 4 has been predated and that the 3 are the replacements. It could be that the first eggs were lost, so it is even more important that these eggs are not. We just need to get the chicks out of those shells and off into the long grass, where they will stand a decent chance of survival. Until then, I am on tenterhooks. The spring traps are all working very nicely as the spring progresses, and I wanted to offer this blog’s faithful readers a deal after another stoat brought to book this morning. When I have remembered, I have been collecting stoats’ tails for the past six weeks and I now have about half a dozen in the freezer. Given the fraught nature of my life at this time of year, I wanted to throw the door open to anyone who wanted them for the sake of fly tying. All I’d ask in return is a few flies made from them, either for brown trout or sea trout. I have also got access to the chance of a salmon (which would be another first) in the autumn, so suggestions are welcome. I have got everything I need to tie my own flies and I sometimes find the time to do so, but I have a feeling that it’s just not going to happen this year. At the same time, I’ve never caught a sea trout and am determined to do so this summer. It would be fantastic to catch a sea trout on a fly tied with Chayne stoat hairs, so if anyone wants to take me up on this arrangement, I am open to discussion. green ribbed sedge (top) and what it looks like once it has been through a blackcock. 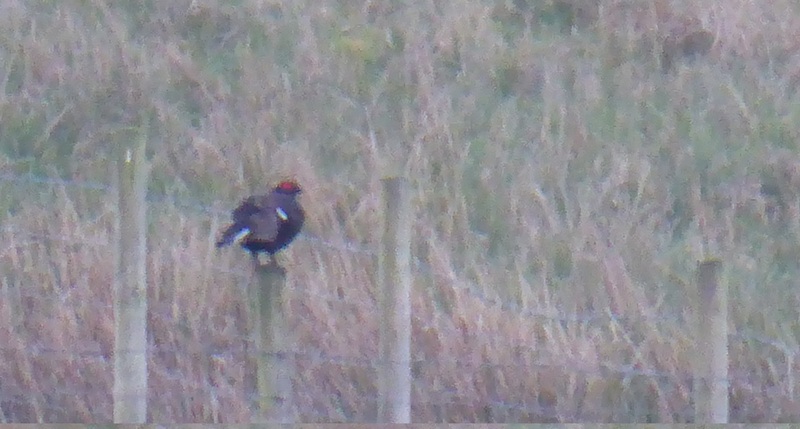 Just worth recording in brief my discovery of a new foodplant for the black grouse on the Chayne. I was watching a proud and illustrious bird sounding off on the peat haggs yesterday morning, and afterwards went up to inspect his display ground once he had cleared off. I found a few droppings which were surprisingly yellow, pointed at one end and shot through with brownish purple flecks. Black grouse eat a lot of pollen from trees and grasses through the year, and this is a good source of protein for them. 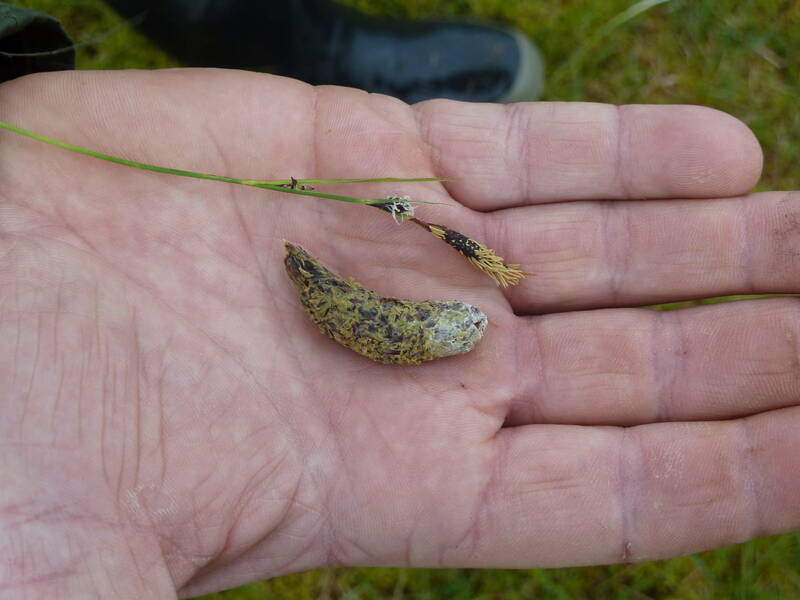 I have found similarly yellow droppings in Sutherland, and while it looked very alarming to begin with, it seems that the colour of the pollen endures the digestive processes. While I looked, it occurred to me that I was looking at a dropping made up of the remains of a certain plant which has been very conspicuous on the hill over the past few weeks. I found a sprig to photograph (above), and now that I’m indoors, I can see that it green-ribbed sedge – carex binervis. I found several other droppings elsewhere, and it seems like this blackcock is specifically targeting the sedge and eating it over all other available foodplants. Green ribbed sedge currently looks rather like cottongrass flowers did a month ago, when the pollen was spraying out of the heads, and I suppose that if grouse like the mosscrop then there is no reason why they shouldn’t feed on similar species when they are at a similar stage.